If it wasn't for our local shelter "Dyreværnet", here in Copenhagen, I would never have met Viva. And they didn't rescued her once, but twice, in the first 5 years of her life. Until Viva came and lived with us, her final and loving home. Forever thankful I am, for the 3½ years we got together, where Viva's touch changed me into who I am today. I hope you want to join me in supporting her shelter with a donation as an act to remember Viva by, share her goodness, and help the shelter to take care of dogs like Viva, so they too can find a loving home. If you decide to do so, we would love to thank you with a personal message, so please mark your donation to the shelter with "Viva". 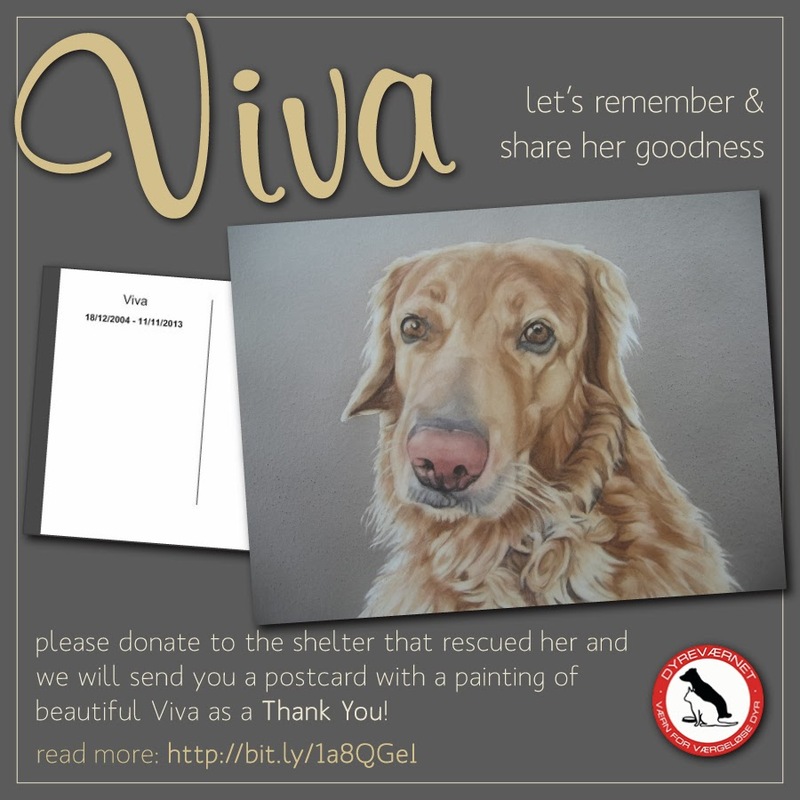 Then we can send you a postcard with Margie King's painting of beautiful Viva as a Thank You. On the top, in the grey box, you can chose an amount in Danish currency- a quick currency converter: 100 Danish kroner is approximately 13,50 Euro. "Vælg betalingsmetode", chose payment method, her you pick "Dankort/kreditkort", to pay with your credit-card. "Att", attention, here you fill out "Viva", this is important, to get the postcard. "Postnummer & By", postal code and city. Check the last checkbox, "Ja, jeg accepter betingelserne", meaning you accept the conditions. Press "Send", and the payment dialog starts. Alternatively, you can also transfer money directly to the shelter's bank account, account number 5329-0242143, "Arbejdernes Landsbank". Remember to pass your address information and "Viva" along in your transfer. Thank you so much for your donation, and we are looking forward to send you the postcard with Viva's painting. Bless you! "Dyreværnet" relies solely on donations from the public. They are the only no-kill shelter in Denmark and re-home all animals, either furred or feathered. We will try to make a donation - do you know if I can do that with USD? Thank you Christine! It is pre-set to Danish kroner, unfortunately. Also when you donate through your credit card, it remains in kroner, although the cc company will at the end convert it to USD and charge your account. A quick example for 100 kroner, it is the equivalent of 18,21 USD.